A detachment was sent to NAF Fernando de Noronha Island to conduct daily sector sweeps and antisubmarine patrols. Facilities at this tiny base located 210 miles off the eastern coast of Brazil were cramped and primitive. 29 Apr 1944: VP-45 deployed to NAF Belem, Brazil, with detachments maintained at NAF Amapa and NAF Sao Luiz, Brazil. Duties consisted of sweeps and antisubmarine patrols. 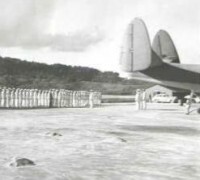 Operational control over the squadron was exercised by FAW-16.7 Jun 1944: A detachment was sent to NAF Fernando de Noronha Island to conduct daily sector sweeps and antisubmarine patrols. Facilities at this tiny base located 210 miles off the eastern coast of Brazil were cramped and primitive. VP-45 shared the base with PV-1 Ventura landplane detachments from VBs 125, 134 and 145 based out of NAF Pici Field, Fortaleza, Brazil. 1 Oct 1944: VP-45 was redesignated VPB-45. During this period the squadron conducted routine patrols and was additionally tasked with training Brazilian aircrews at NAF Galeao Field, Rio de Janeiro. Jan 1945: One aircraft was reported overdue from a patrol and presumed lost. Although weather may have been a factor, enemy action was more probable as German U-boats were increasingly heavily armed. 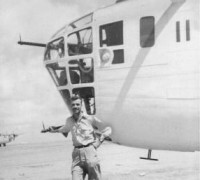 In the previous year several Navy patrol aircraft had been shot down or damaged while attempting to complete a bombing run on surfaced submarines. Feb 1945: Six of the squadron’s aircraft were detached to Ascension Island for antisubmarine patrols and convoy coverage. 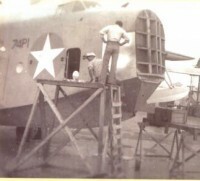 15 Mar–22 May 1945: VP-45 was relocated to NAF Ipitanga, Bahia, Brazil. 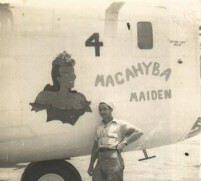 Routine patrols were resumed until orders were received on 22 May 1945 for return to the continental United States. 27 May 1945: VP-45 reported aboard NAS Norfolk, Va., under the operational control of FAW-5.5 Jun 1945: VP-45 was disestablished at NAS Norfolk.